In this pAsuram, mAmunigaL is following AzhwAr’s pAsurams of becoming bewildered thinking “I am unable to fully enjoy emperumAn‘s qualities due to limitations in my senses” and emperumAn eliminating such bewilderment, and is mercifully explaining it. How is that done? In the previous decads, AzhwAr tried enjoying the beauty etc of azhagar emperumAn but could not do it fully; he thought “it must be due to limitation of my own senses” instead of realising that it is due to emperumAn’s greatness; he became overwhelmed with sorrow thinking “emperumAn performed srushti (creation), avathAra (incarnations) etc to let me enjoy him fully without any limitations in senses; but I have lost it and am in a disastrous state now; will I be able to reach him now?” and called out for him in thiruvAimozhi 3.2 “munnIr gyAlam”; mAmunigaL mercifully explains this starting with “munnam azhagar ezhil“. Previously AzhwAr became immersed in azhagar emperumAn‘s beauty; the ignorance caused due to the limitation in senses of AzhwAr who mercifully said “even for me, it is difficult to measure his beauty to be as a particular level”, was eliminated by emperumAn as he pacified AzhwAr’s heart. enakku aridhAyththu enna – AzhwAr said “even for me who is blessed with unblemished knowledge and devotion by bhagavAn, it is difficult [to measure emperumAn‘s greatness to be of a particular limit]”. 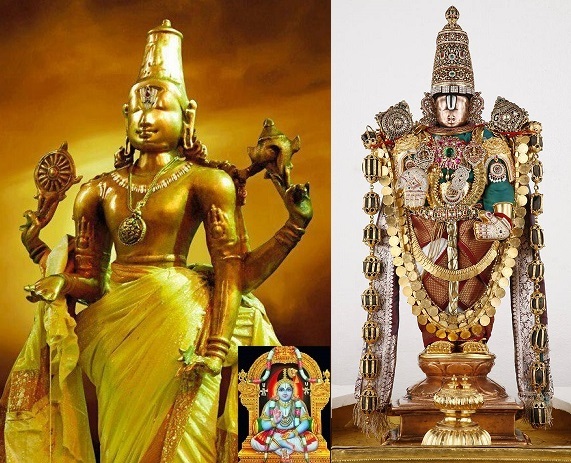 As AzhwAr says in thiruvAimozhi 3.2.1 “thirumAlE katturaiyE” (Oh lord of SrI mahAlakshmi, please tell), emperumAn who is having unbounded knowledge and fully knowledgeable on his own, due to being together with SrI mahAlakshmi, it appears that AzhwAr cannot comprehend it fully. karaNak kuRaiyin kalakkaththai – The ignorance which occurred due to the limitation of senses which were given to be put in use for emperumAn’s purpose. As mercifully explained by AzhwAr in “annAL nI thandha Akkaiyin vazhi uzhalvEn” (you gave me a body; but in such day when I have become pitiable having gone in the ways of such body) [1st pAsuram], “vinaigaLai vEr aRap pAyndhu ennAL yAn unnai ini vandhu kUduvan” (after eliminating all the sins, when will I come and unite with you) [pAsuram 1], “panmA mAyap piRaviyil padiginRa yAn thonmA valvinaith thodargaLai mudhalarindhu nin mA thAL sErndhu niRpadhu engyAnRukolO” (I am living in a well fitting manner assuming many different forms in prakruthi which is amazing and variegated, is very difficult to cross over and which exists for your sport. When will I cut off the countless chains of sins, which are difficult to eradicate and which exist since time immemorial, reach your divine feet which are having great glories and stay there firmly?) [pAsuram 2], “pollA Akkaiyin puNarvinai aRukkalaRA sollAy yAn unnaich chArvadhOr sUzhchchiyE” (even if I tried to cut off the connection with the body I am unable to do so; please tell me a distinct method to reach you) [pAsuram 3] etc. It is said in SrI rAmAyaNam sundhara kANdam 37.6 “lankAmunmUlithAm kruthvA kadhAdhrakshyathi mAm pathi:” (My husband SrIrAma will cause destruction for the rAkshasas, kill rAvaNa and destroy lankA completely and will see me always). Such bewilderment was caused by the limitation of senses. kaNNan orumaip paduththAn ozhiththu – krishNa who removes the sorrows of the devotees as said in SrI bhagavath gIthA 18.66 “mA Sucha:” (Do not grieve), removed sorrow in AzhwAr which was caused due to the limitation of senses and pacified the divine heart of AzhwAr to let AzhwAr fully enjoy him with his senses. mAmunigaL is mercifully following the words of AzhwAr “kalaip pal gyAnaththen kaNNanaik kaNdu koNdu nilaip peRRen nenjam peRRadhu nIduyir” (after seeing krishNa who is known by many types of vEdham, eliminating such sorrows, my broken heart acquired stability and the AthmA acquired eternity) [10th pAsuram]. emperumAn manifested his presence in periya thirumalai (thiruvEngadam, thirumalA thiruppathi) where he was accepting the service of animals which have very limited senses, and pacified AzhwAr. This entry was posted in Other, thiruvAimozhi nURRandhAdhi on December 19, 2018 by Sarathy Thothathri.